Mexico’s new president Andrés Manuel López Obrador (AMLO) was elected amidst record levels of crime and violence. Official statistics show that a person was killed every 15 minutes in the run-up to the elections, putting the country on track to surpass in 2018 even the grimly historic 2017 peak of over 31,000 homicides in a single year. Unlike in Colombia and some Central American countries – and excepting the Zapatista movement in Chiapas in the 1990s­ – Mexico’s violence has not been of a political nature. It is mostly related to the underground economy. AMLO’s innovation was to promise to tackle insecurity head on through a more integrated approach that would address the root causes of violence rather than simply applying brute force as his predecessors had. But will it work? For AMLO the big challenge is to reactivate job creation and growth in an inclusive way in the legal economy. For this he will need to improve job creation for the young, particularly in the southern states, where poverty rates often reach 70 per cent. Security may well be a precondition to economic transformation to create a more dynamic, fair, and sustainable economy. At the same time, AMLO’s peace and security challenge will remain elusive unless he uses reforms to improve democratic practices and human rights, to reduce corruption and impunity, to restructure society through provision of basic services and human development, and to incorporate those involved in illicit activities into society and the legal productive economy. As many experts assert, security may well be a precondition for the success of the overall transition to a more inclusive and less violent society, but political reform and socio-economic transformation will in turn affect the violence and security conditions in the country. This alludes to the fact that the effects of new policies are variegated: political and socio-economic reforms may prove futile without security, but security will not take root without progress in those other areas. An integrated approach has often proved crucial in carrying out a successful transitions to peace, stability, and prosperity for all. It is not surprising, therefore, that attempts by Presidents Calderón and Peña Nieto to solve security issues by force alone have led to a severe deterioration of security since 2006.
and violence in the country. This will mean promoting sustainable advances in inclusion and stability, but without also putting at risk the gains of previous governments in terms of financial stability, trade, and investment. To this end, AMLO will have to achieve public security and eradicate corruption in the armed forces, as well as in Mexico’s notoriously corrupt police force. In parallel, he will also need to improve governance at the federal and state levels. Security forces and governance will need to become more effective, transparent, and respectful of the rule of law, human rights, and property rights. AMLO will need to make sure that his message consistently supports social cohesion instead of reinforcing divisions. Last but not least, AMLO will need to transform production so that it enables ordinary people — including the young and the poorly educated — to gain employment and earn decent and legal livelihoods. Addressing these problems always has financial implications that will not necessarily coincide with purely economic objectives and will often compete with them for scarce resources. 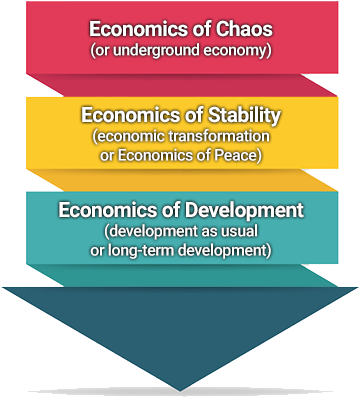 The experience of the last two decades has shown that highly insecure countries cannot move into sustainable long-term development unless they first engage in the “economics of stability”, which constitutes an intermediate and distinct phase for reactivating the economy while simultaneously mitigating the high risk of a relapse into chaos. The “economics of stability”, characterised by efforts to stabilise security not the economy, will be particularly challenging. This phase also requires an efforts to overcome the interests of spoilers – those that thrive during chaos and hence oppose stability – such as organised crime and other criminal groups. These groups have a significant economic stake in drug production, drug trafficking, smuggling, kidnappings, extortion, and the many other lucrative but illicit activities that flourish in situations of chaos, corruption, impunity, and poor governance. This intermediate phase is necessary before Mexico can fully engage in the “economics of development” – that is, in “development as usual” that targets the kind of optimal or first-best economic policies that are utilised in countries unaffected by insecurity or chaos. Unless the economics of stability succeeds, development will inevitably fail, as indeed it has in Mexico up to now. Development simply cannot prosper amid large insecurity and violence. The development-as-usual economic policies of previous governments – acting as if there were no security crisis – have improved neither standards of living nor the institutional and human capacity of the country. This has deprived large segments of the population of the education and technical skills demanded by the market. Without these qualifications, these segments have been unable to access most of the employment opportunities in the country, instead remaining in poverty. 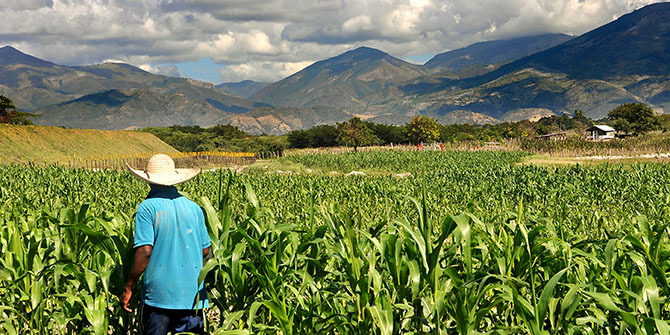 Thus, AMLO’s proposal to support the agricultural sector may not be an optimal policy on purely economic and financial grounds, but with enough financial and technical support from the state, this sector could provide fair living conditions and better livelihoods to a large sector of the population. Above all, it would make a difference to those that lack the necessary skills to get jobs in other legal activities like manufacturing or services. 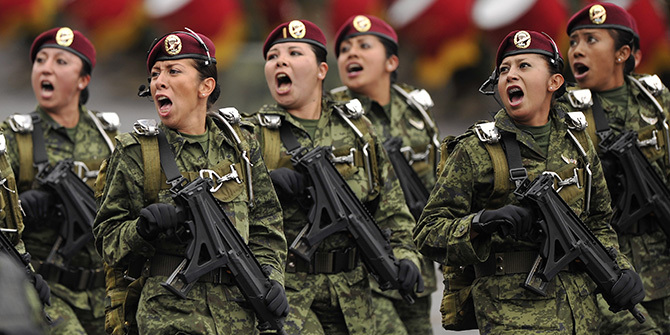 One eye-catching and controversial element of AMLO’s plan is the creation of a National Guard. Contrary to existing practice, security will be outside the control of the corrupt Federal Police, with the Guard initially marshalled by the Mexican Office for National Defense (SEDENA), which is responsible for managing Mexico’s military forces. In the first phase, the Guard will be made up of selected members of the military, naval, and federal police (some of whom will join through conditional amnesty). This Guard will be a key element in stabilising the country by pacifying criminal organisations through disarmament, alongside a process of transitional justice that guarantees victims’ rights. The plan contains seven other pillars that will give the fight against insecurity a new face: strong controls on corruption; development projects to reduce poverty through improvements in employment, education, and health; greater respect for human rights; a moral pact to improve relations between citizens and a newly thrifty, honest, and inclusive state; a reorientation of “drug war” resources towards reintegration and detoxification programmes; improved living conditions, including in prisons, to promote social reintegration; and pursuit of a culture of peace and transparency within the security forces, as opposed to their repressive and corrupt culture during the Calderon and Peña Nieto governments. The more successfully AMLO implements this plan, the sooner the Mexican government will stop acting as a recruiting agent for organised crime and drug traffickers. An underlying factor in the success of criminal groups has long been their ability to attract recruits by providing them with the jobs and services otherwise unavailable because of the repeated policy failures of previous governments.